Like everyone else with an International chassis coach, I have been looking for a better suspension for the rear of the coach. I love this unit and plan to keep it for a long time. No problems in the drivers seat but the wife has never cared for the ride past mid-coach. So, I drove the Nova down to SW International for them to take a look at the frame and suspension layout to see about getting shocks installed. The Specialty Equipment Manager said I should consider an aftermarket air suspension system complete with air compressor. Cost is a little under $4900.00 so I told them to order it. It is made by American Carrier Systems out of Fresno, CA. I looked at the system and feel good about the engineering. It comes with its own shock package so it kinda kills two birds with one stone. He is going to order it tomorrow and I will get it installed as soon as it arrives. The technician that is going to install the system looked the Nova over from the underside completely. He did not see any complications that would keep the system from being installed, plenty of clearance room down there. I told him I wanted to add air horns later and he said that would not be a problem. I will most probably add them along the frame rail next to the air compressor so they are at the level of the cars. Should be real loud down there! I will keep you all informed of the progress. That is good price for the amount of work and is there a specific item number for this package? Keep us posted on change out and your evaluation. I will know more next week when the system arrives from California. Right now, it looks like I will get installation during the week of September 14-18. The brochure I downloaded from their website said it will be delivered completely assembled and should be installed within a day. Keeping my fingers crossed this will be a relatively inexpensive solution to all of our ride issues. SW International is really excited to be able to try this application on my coach. They have asked to put a "Air Ride by Southwest International" logo on my coach. I agreed if it were small and matched the decor of the Nova. One of the benefits to this system is that it has a backup in case of an air leak or air failure. The leaf springs are attached to the air ride component so if air is lost, it simply reverts back to the leaf spring suspension but with the added benefit of the included shock package. I asked about dislodging the air bags while using the leveling jacks and was told that their are limits built into the system that would keep this from occurring. I have heard of a few Dynamax coaches that have had issues where the airbags have become dislodged when using the jacks. This should not happen with this system. I am really excited about trying this relatively inexpensive air ride suspension application on the International chassis. I will certainly report the results, good or bad, when the installation is complete. I am going to the Drag Races in Ennis Texas right after the work is complete and then to Arizona to visit the kids the first week in October. The second trip will give me a great opportunity to evaluate the results. The International Manager guaranteed me that if it works on the coach application like it has on some of the other trucks they have installed it on, my wife will be able to sleep comfortably on the rear bed while traveling down the road. (Don't want a discussion on safety issues here but she would love to be able to nap back there from time to time). Much more information to follow! We highly recommend this suspension mod. We had the Superride 800 series air suspension system from American Carrier Equipment installed on our SuperNova in July from Middleton & Meads Co. in Baltimore, MD. We paid slightly under $6,000 when all was done which included the air compressor. We are very happy with the ACE suspension and feel it improved the ride & dampened the road vibrations, bumps, and noise. It doesn't ride like a Class A with lots of air bags but we also didn't have that expectation. :0) Also, the air suspension leveled the rig for us. Our SuperNova had a slight lean since the driver's side is much heavier then the other side. (Due to slide, water, generator). One item of note according to ACE - The Superide air suspension is an add-on unit that takes advantage of existing leaf spring suspensions. The Superide suspension performs like a full air ride and it has two added design advantages: it requires no changes in the vehicle's original suspension specifications and it has a built-in safety stop. If the air spring deflates, the vehicle will revert to its original leaf spring suspension. We only had one slight problem after we picked up the rig. The wiring harness for the jack melted when the shop did the welding for the air bag install. Got it fixed at our dealer within a day and haven't had any problems with the leveling jacks & air bags. I can try to post/mail pictures if interested. Thanks so much for your analysis. I looked at several systems before deciding on the ACE application. I, like you, really like the redundancy of having the original springs there in case of an air problem. I like the unit having its own shock package and I like the price vs. changing the entire rear carrier in order to put in International oem air suspension. I am glad to hear you like your system and now, more than ever, am looking forward to the installation next week. I will alert the International technician about the wiring issues. When he did a survey of my frame, he mentioned that many of the wires that operate many systems on the coach are in that general area. I will try to get him to insulate them well while doing the welding. Although I have only driven the Nova about 50 miles, I truly love the air ride suspension system (American Carrier Equipment Superride 800). This will be a short report and I will give my thoughts after our trip to Arizona in early October. For now, it is great. Like Kimbo, I have an error issue with the electric jacks. I will get it to the RV dealer on Monday. International said they would cover any costs. Total cost to install with tax was just under $5200.00. I called my buddy JimBob and gave him a glowing report on the phone. Now he is considering bringing his coach to Dallas for the same system. (Good to talk with you JimBob and continue having a great trip). My wife went on the test drive at the dealer and sat on the bed and on the sofa. She said the ride on the bed is now like the mid-coach sofa and the sofa is like riding in the front seats. (Yea, I really wanted her to be pleased with this upgrade). More information to come after our longer trip next month. I took the Nova in to Mc Clain's RV, my dealer, on Saturday. They had to adjust the magnet limit switches and re-set the level on the Power Gear system and it is good to go. There was no damage to the leveling system, only a reset and re-adjust. I am sure Southwest International will be glad to know this since they are paying for the fix. I will pick the coach up on Tuesday and get ready for my boon docking trip to the drag races. I cannot wait to drive this thing some more. It took the rough part of I35E great when I was driving it home. There is some construction on the route I will be taking later this week and I am looking forward to see how well the air ride handles uneven and rough sections of the road. I am also looking forward to seeing if there is any change in the way it handles in windy conditions and around other high profile vehicles. As we owners all know, these things handle so well in those conditions. I am quite sure that there will be no adverse effects with the air ride but want to drive in those conditions to be assured. Jim Bob sends congratulations to his pal, Texas TC, on the birth of his new baby. The newborn weighs in at an impressive 26,900 pounds, and was born at Southwest International at Dallas Texas last week. Way to go buddy- enjoy your new coach and have a safe trip to the Drags, and then out to Arizona....... Where's the decal pics????? 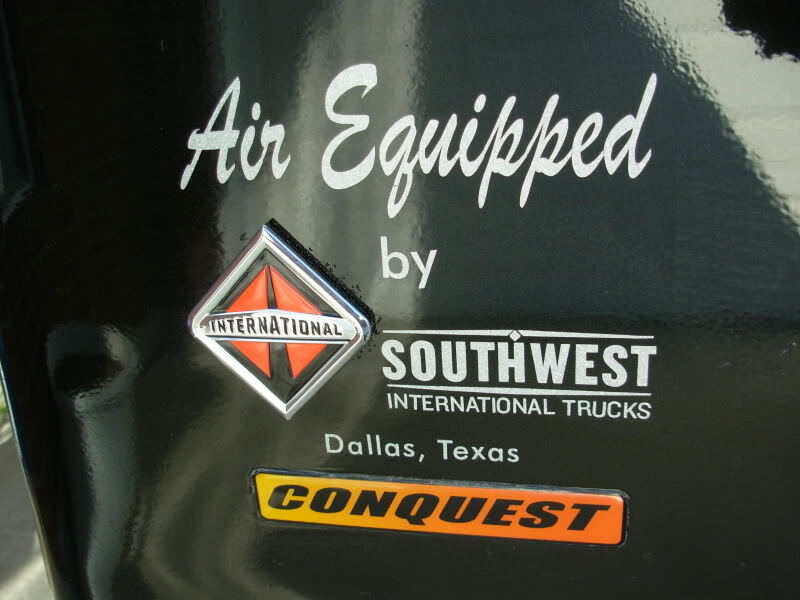 Here is the decal Southwest International provided for our Nova! I was at Southwest International today and spoke with the Manager of Special Equipment and the GM of the dealership. They are both really excited, as am I, about the installation of the air ride system on the International chassis. Special Equipment Manager, Aaron Redmon, said if anyone is interested in having the same system installed, or just has some questions about the system, he would be glad to help them out. He agreed for me to post his phone number for anyone interested, 214-689-1400 or 214-638-4685.